At the time of the Pro Tour in Albuquerque, Ixalan will have been out for well over a month. This is different than any Pro Tour I've covered since I started doing so a little over five years ago. It completely changes how the players prepare and approach the format. During the normal Pro Tour schedule, the players have a short amount of time to try to figure out the Draft format while simultaneously sorting out the entire metagame for the Constructed format. It's a daunting task and one that most players would admit they could use more time to complete to their satisfaction. Part of the excitement for us viewers is based on the fact that these players are working with incomplete information over a short time frame. It puts a lot of pressure on the players to come up with reasonable assumptions about the formats and then act on them. The ones who do this well tend to win more over the long term, but any given Pro Tour can have a lot of home runs as well as a few strikeouts. This is also why you see so many players team up for testing, even though Magic is largely played individually. This time around, the players are going to be intimately familiar with the Draft format. Many will have played in Grand Prix Phoenix, some played at the World Championship, and virtually all of them will have far more drafts under their belts than at any other Pro Tour in years. Many players will have done well over 100 drafts, and there will undoubtedly be some with even more than that. The baseline preparation for events like this is to figure out which colors and color combinations are the strongest, and then figure out which cards are to be prioritized and which are over- or underperforming. This gives the players a solid starting point when they sit down at the Draft table. What this doesn't do is give the players a great sense for the intricacies of a Draft format. The subtle decks that come up one time in fifteen drafts, but are strong when they do. The weird build-around cards that seem like they might be worth it, but you can't quite tell. The off-the-map color pair that just might work. Often the players just don't have enough information about these cards to really go for it when they sit down and see them in the packs they open. Sometimes we see players take radical stances on the format in order to try to have a more fixed game plan coming into the tournament. One example of this in Ixalan was the approach taken by Christian Calcano during Day One of the World Championship. He drafted a hyper-aggressive black-red deck featuring a bunch of one-drops and four copies of Swashbuckling. This is a high-variance take on the format to be sure, but in the early stages you can often get away with it because your opponents may not be expecting it, and because they haven't sorted out the really good decks in the format yet. This kind of deck tends to either smash the opponent quickly or fall hopelessly on its face. At Pro Tour Ixalan, the majority of the players will have a strong grasp on the format. This is going to be a refined format full of experts, and it's going to be rough out there. I don't expect the more fragile strategies like the all-in Auras deck to perform very well in a more mature field of drafters. What Should We Expect to See from the Players? First, the baseline archetypes are well explored and well understood. White-Black Vampires, Green-Blue Merfolk, Red-White Aggro (with some Dinosaurs), Blue-Black Pirates, Black-Red Pirates, and Red-Green Dinosaurs are all well-known archetypes that the players will be hoping to fall into. The tricky part about this format is that it's relatively unforgiving. We've gotten used to formats where even the "bad" cards are pretty playable. Limited wasn't always this way. There used to be horrendously unplayable cards in the packs, and some people even used to play them. As the information about Limited has increased thanks to the popularity of Draft videos, podcasts, articles, and coverage of drafts, the baseline for Limited players has increased. The combination of the average card quality being raised plus the players improving has made it so that even bad Draft decks end up being passable for the most part. You really have to work hard to get a true train wreck draft deck these days. That said, Ixalan is a bit different. The dynamic with the format isn't like one we've seen recently, and if you get it wrong, it can go very wrong. Ixalan is a tribal format, so it's best to be in a tribe. Tribal synergies are how you take a pile of cards and turn it into a fully functional deck. Here's the catch—not every color pair has a tribe associated with it, and even some of the ones that do are significantly worse than the other options. Broken down roughly, that means that White-Black Vampires, Blue-Black Pirates, Black-Red Pirates, Red-Green Dinosaurs, Red-White Dinosaurs, and Green-Blue Merfolk are your main archetypes, while White-Green Dinosaurs and Blue-Red Pirates are just okay. White-blue and black-green don't have any association with any single tribe, though black-green does have two payoff cards for being heavily into the explore mechanic. In most cases, we are looking at a format that has about six good draftable color pairs, with the other four ranging from hit-or-miss to just plain not good enough. The means the players are all actively looking to get into their "lane" as soon as possible. This isn't that different from most Draft formats, except that there are fewer lanes than normal, and if you muck about too long, you could find yourself low on playables since this format is shorter on those as well. The nature of tribal synergies also plays into this, as some cards that are prized possessions for one deck become nearly unplayable in other decks, even if they share a color. River Heralds' Boon is one of the best cards in a Merfolk deck, but it's barely playable outside of it. Anointed Deacon is a good finisher for White-Black Vampires, but is basically unplayable outside of that archetype. Otepec Huntmaster is an engine that pumps out haste Dinosaurs if played in the right deck, but Black-Red Pirates doesn't even look at it. Kumena's Speaker and Vineshaper Mystic are both awesome in Green-Blue Merfolk, but nowhere else. The result of all of this is that the players face a tough decision: Do you stay open to try to find your lane but give up some valuable picks early, or do you commit hard to a known archetype and keep your fingers crossed that it gets there? Most of the players at the Pro Tour will be doing their best to make the former work, as the upside is high if you can find which colors you are supposed to be in. The highest possible upside goes to the player who commits the earliest and is in the correct lane, though that requires a fair bit of luck to work out. The biggest signpost you'll see while watching the Pro Tour coverage is if a player is willing to take a powerful multicolor card early in the draft, or if they prefer to take a less powerful single-color option in order to stay open. My favorite archetype in the format has been White-Black Vampires. This color combination has all the benefits of the tribal synergies but also has a solid game plan against all the decks you are likely to face in the format. The Vampire deck has a good early game, a good middle game, and a good-enough late game to battle aggressive, midrange, or even control decks (though you won't see many of those at this Pro Tour). 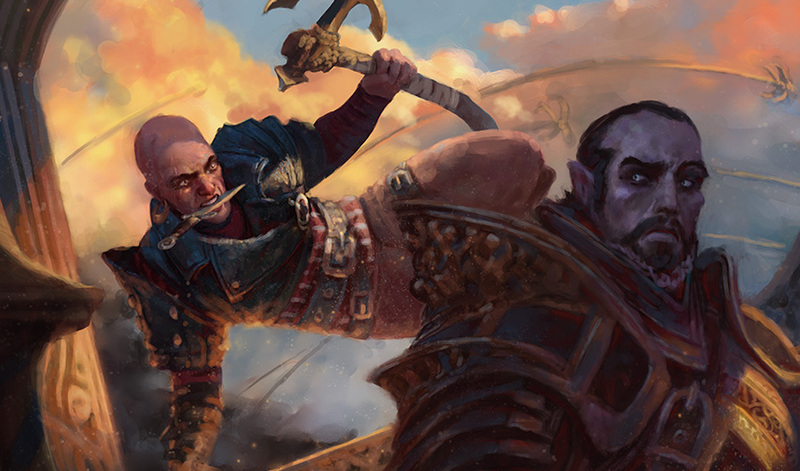 Aggression is still the name of the game, with cards like Territorial Hammerskull, Skulduggery, and River Heralds' Boon really coming into their own over the course of the early part of the format. I heard a piece of advice from soon-to-be Hall of Famer (in fact he will be inducted at a ceremony shortly before this very tournament! ), fantastic Limited mind, and all-around great guy Martin Jůza that I think is particularly relevant in this format and for this Pro Tour. He said, "When you are debating between two close picks, take the cheaper one." It's a super simple guideline, but it's often correct—and in a format that can be as fast as this one, getting on the board early (whether to attack or to block) can be the difference between losing and winning the game. If you like drama, you're going to want to tune in to the drafts at Pro Tour Ixalan, and you're going to want to fasten your seatbelt! The players are going to be put in a spot where they must make critical decisions early in the draft that will play a big part in determining if they draft a sweet 10/10 or a total dud. The good news? We get to watch it all unfold in front of our very eyes!